These past weeks have just flown by ! No real stress but various activities that kept me away from the PC. 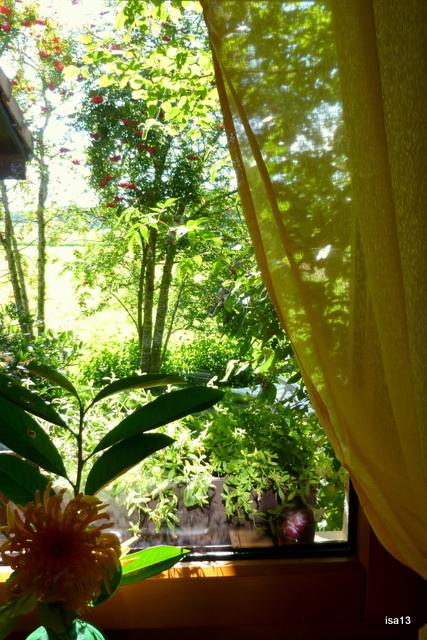 Let’s have a look at some of my Summer windows that will tell you a little more. There were several friends who stayed at home for a while. Together we visited the old town of Fribourg and some of the small workshops. Behind the bars, an old low-ceilinged room or rather a real Aladdin’s cave with antique furnitures, lamps, dishes, jewels, coins, precious fabrics, and so much more. Having decided a while ago to do some serious clearing up, I resisted buying anything. Do not think though that I have not thought of it ! In the same area of the old town, behind St-Nicholas’ Cathedral, there is a small art gallery I visit now and then. I went there with other friends on a rainy Sunday morning. A very colourful and joyful exhibition welcomed us. A painter/textile artist and a ceramist had created special artworks that I will show you in more details later. 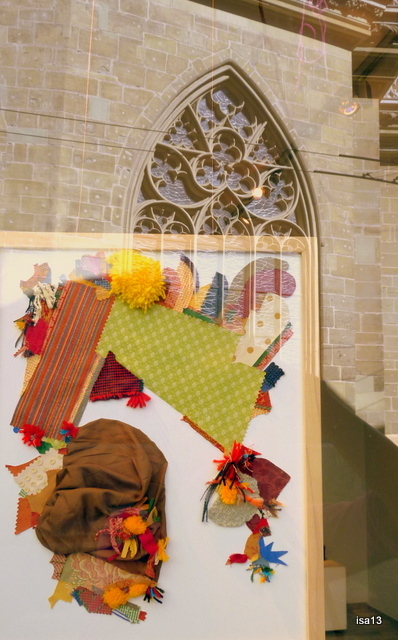 The gallery window showed a big white canvas where the Italian artist had sewn or stuck all kinds of fabrics and other materials. Fascinating ! And so inspiring. This is part of the view from our car window as we drove to the mountains with the family. 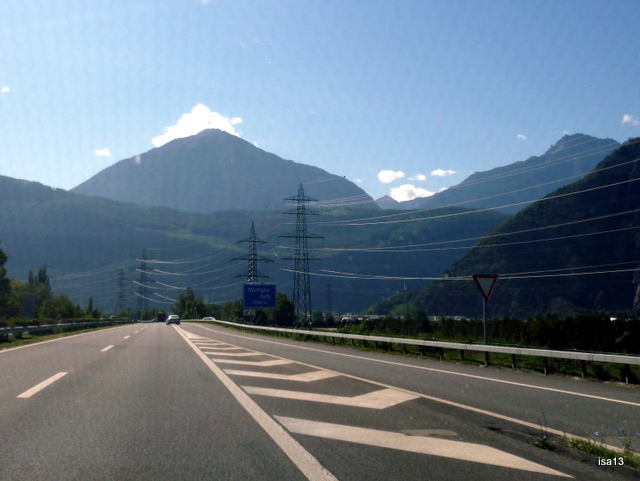 Italy is right behind those mountains on the right but on that particular day we turned left to the Alps and the village where we took part in a family celebration. Another view from our car window. 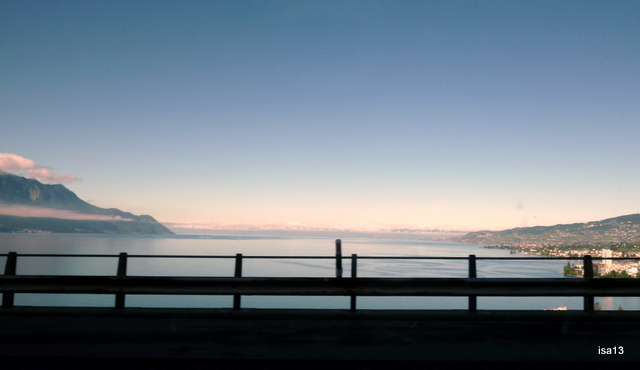 We were driving on a highway along the Lake of Geneva. Switzerland is on your right, the French shore on the left. The city of Geneva lies on the far end of the lake. On a clear day, at any hour but especially at sunset this landscape is just breathtaking. Can you spot the first autumnal mist on the French side ? Just in case you wonder about these two pictures … I was not the driver. 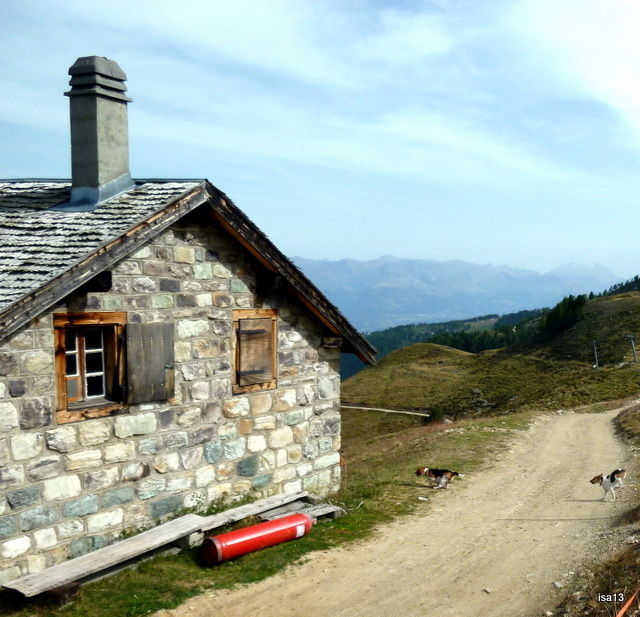 Up in the mountains and strolling through an almost abandonned hamlet. 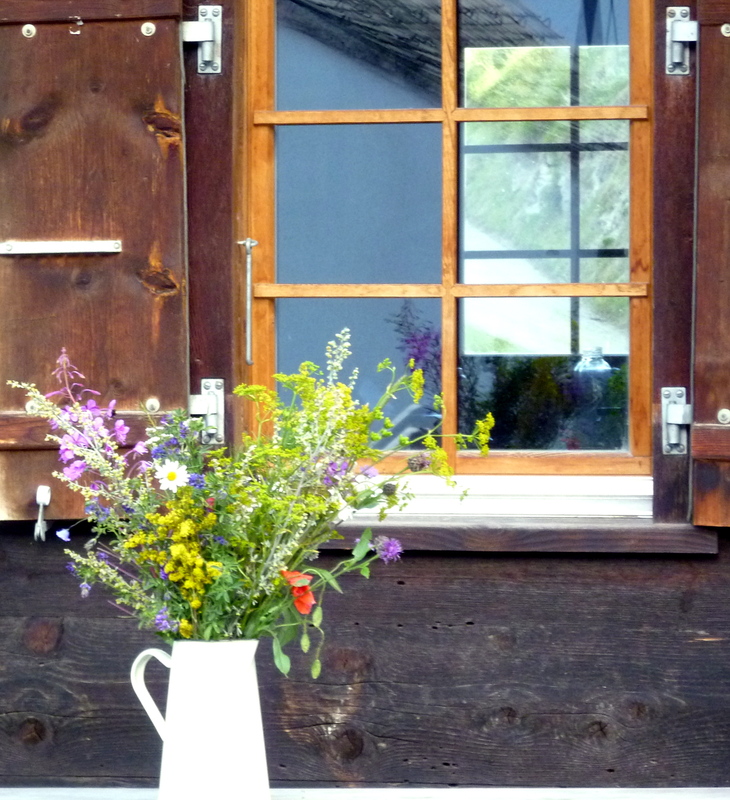 A young couple whose great-grandparents had lived there earlier had decided to restore their chalet. They started with the roof and the windows. I must say it was a happy and encouraging sight for this tiny village is a precious memory of past times although modern additions (road, electricity…) make life easier up there. A daily hike to high mountain pastures (about 7000ft). Two energetic dogs were so happy to meet and run together : a tourist Beagle 😉 (my Ninio) and a resident Jack Russel. 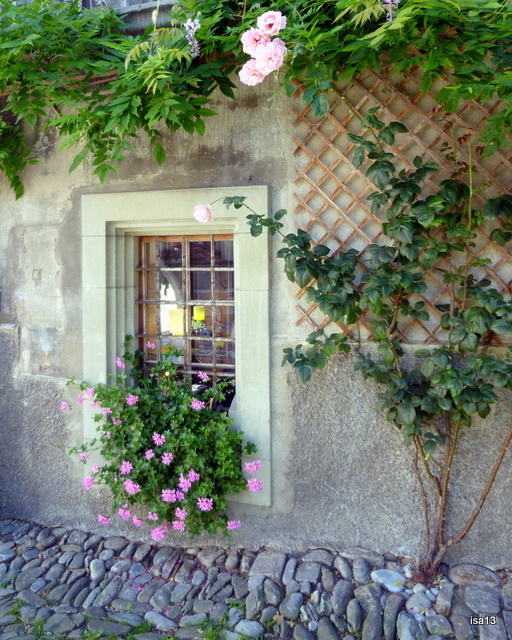 A young French lady lives in the small stone house for the Summer Season while the cows graze up there. Her window opens on a bare landscape but for a few “arolle” trees. There are a special kind of pines (Pinus Cembra) which resist the low temperatures in Winter. Her window also opens on a vast corrie of mountains. The lady is the cheese maker of this particular pasture. The large round pieces of cheese she produces are very sought-after for their particular taste. If cows could speak, they would tell you how good the grass tastes up there with all the wild flowers covering the pastures from June till end of August. This is my kitchen window at home. One I never tire to look through at any Season. At this time of the year the greenness is dazzling. The rowan-tree attracts lots of birds who take their turn more or less patiently to eat its berries. It is noisy, happily so. The wheat field is blazing under the sun. In the evening I love to stand there and watch the sun disappearing slowly behind the forest. I am so lucky – and grateful – to live so close to nature ! Now, this is a window I could honestly have done without… Its unfathomable darkness saddens me so much. 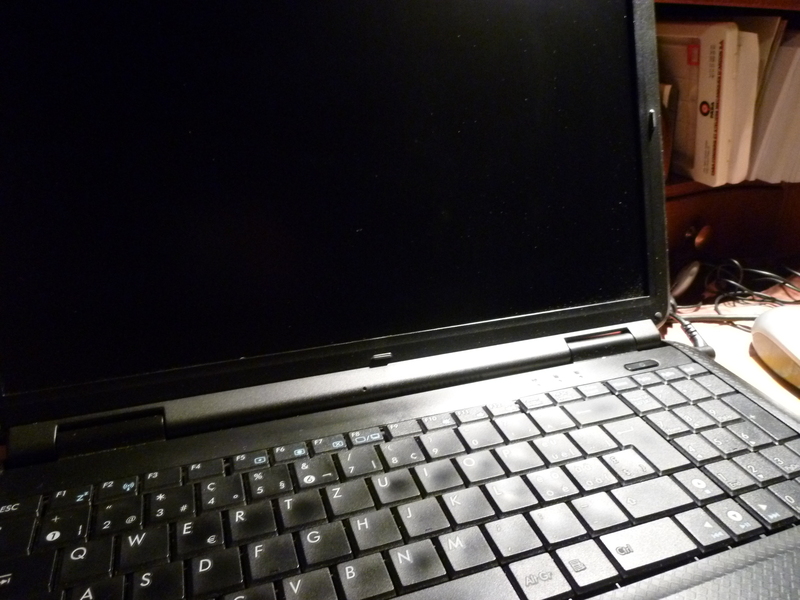 After camera and printer let me down, my laptop refused to respond and start. Yes ! Three devices I took for granted for years just went blank at a few months interval. I must add they all had almost the same age and probably were tired of working. Or of me, who knows ? This black window is also a reason why I did not post much lately. I had to rely on other computers not always available. Now I am back to the family’s old PC. I cross my fingers – and toes – for the good old computer to last until I can offer myself a new computer ! More about it later. So I hope !